Holy Cross is a Catholic High School established by the Catholic Community of the Chorley Deanery. Here you will find lots of useful information for Holy Cross parents inculding terms dates, uniform and admissions. Here at Holy Cross we have an extensive curriculum which is built around key stage 3 and key stage 4. All the latest news, events and newsletters from Holy Cross. 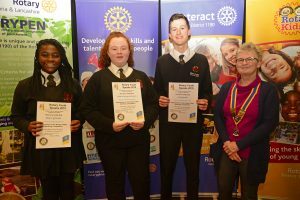 Holy Cross pupils took part in the Rotary Youth Speaks 2019 at Walton-le-Dale High School. 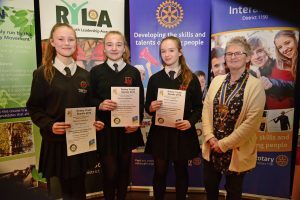 The Intermediate Team of three produced a speech about Equality and Diversity. The team was Alisha, Moyin and Luke. The Senior Team, consisting of Lucy, Melody and Lily, focused on Social Media. “The students had a chairperson who spoke for two minutes, the main speaker was six minutes and then there was a vote of thanks,” said English Teacher Miss Maxwell. Last few days of Book Fair – Don’t miss out! World Book Day Competition Winners! What a great World Book Day! © Holy Cross Catholic High School, 2018. All Rights Reserved.